Jangban guksu is a healthy and delicious noodle dish mixed with assortment of vegetables. 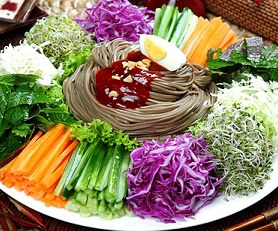 Buckwheat noodles are mixed in with perilla/sesame leaves, cucumbers, lettuce, cabbage, and carrots in a zesty spicy sauce called chojang. Chojang comprises of watered down gochujang mixed with chopped green onions, rice vinegar, sesame seed and sesame oil. Different variation of this noodle dish exist, including a non-spicy version in which gochujang is substituted with soy sauce along with other ingredients as its base sauce. Additionally, thin strips of Asian pear can be added for additional mixture in taste as well as a boiled egg for garnish. To make sauce, you can either add water and sugar; or substitute it with the soda (2-3 tbsp). If using soda, do not add sugar. In a bowl, add gochujang, rice vinegar, sesame oil, and water/sugar or soda. Mix all ingredients together until it becomes diluted. Finely chop green onions and add to mix. Refrigerate for later use. Boil enough water and add buckwheat noodles until it becomes soft. Drain and put aside to cool. Recycle or boil more water to make hardboiled egg(s). Boil for 5-6 minutes and peel off the shells. Put aside for later use. Cut Asian pear, carrot, red onion, and perilla/sesame leaves into thin julienne strips. In a large bowl, mix all ingredients together, including sauce. Cut boiled eggs in half and garnish on top of the dish.